President-elect Trump’s tax plan is somewhat different from the House Republicans’ plan. With Republicans retaining control of both chambers of Congress, some sort of overhaul of the U.S. tax code is likely. That said, Republicans didn’t reach the 60 Senate members necessary to become filibuster-proof, which means they may need to compromise on some issues in order to get their legislation through the Senate. 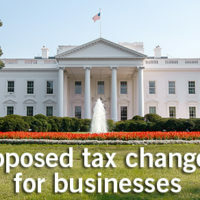 So there’s still uncertainty as to which specific tax changes will ultimately make it into legislation and be signed into law. It may make sense to accelerate deductible expenses into 2016 that might not be deductible in 2017 and to defer income to 2017, when it might be subject to a lower tax rate. But there is some risk to these strategies, given the uncertainty as to exactly what tax law changes will be enacted. Plus no single strategy is right for every business. Please contact us to develop the best year-end strategy for your business.